I know! You are saying to yourself, “she knows that polish is discontinued, she knows it was limited edition…” I do know, I do, but I couldn’t let another Sunday go by without declaring my love for this polish or the show that inspired it! I apologize in advance, but my geek is going to show. Let me give you a little perspective. I would sit in my corner and pooh-pooh the whole Walking Dead mania with my Doctor Who and Sherlock filled fangirl Pinterest board. I avoided the show like I would avoid a zombie! 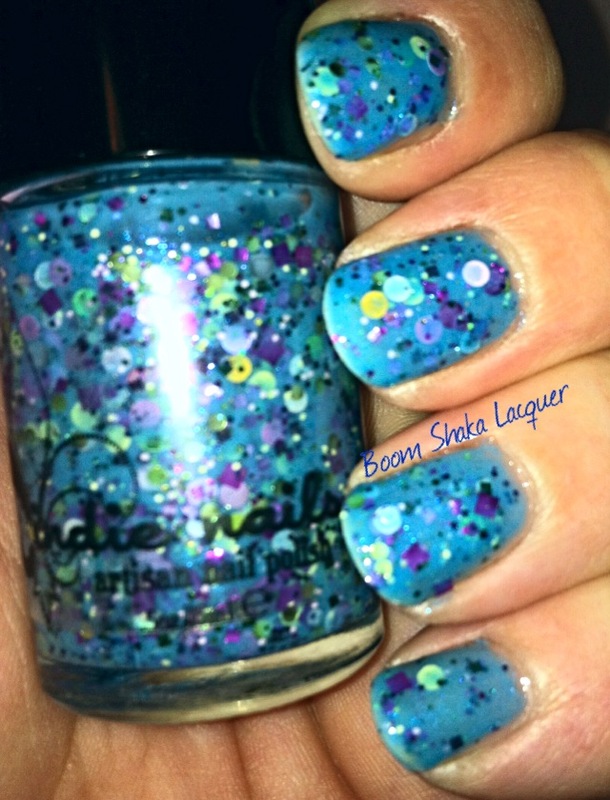 Walker Bait by Dollish Polish was released in all of it’s gloriousness last month and I knew I had to have it! A good friend of mine killed that lemming for me and I ran for my office to put it on as soon as I received it in the mail. Yes we’re finally talking about nail polish now! Look at that – isn’t it stunning? It’s a beautiful olive green base with a hint of sparkle and the best part – it’s a linear holographic polish! This baby just pops off rainbows of magnificence when you hit the sunlight (or a camera flash). The picture above shows indirect natural lighting indoors and two coats topped by HK Girl Topcoat. This picture shows indoors with flash – just look at that holo! 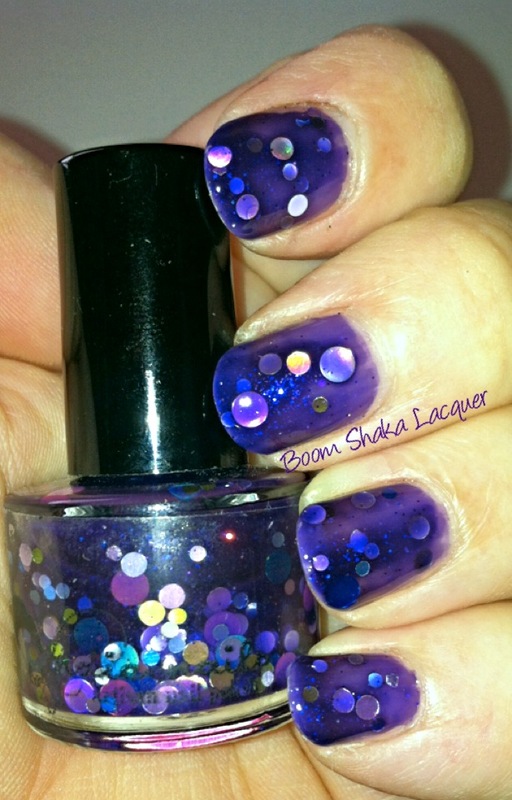 This reminds me, this is one of the things I love about HK Girl, it does not dull holos! This polish lost none of its scintillating prism powers after applying the topcoat. There were no application problems whatsoever and it was opaque in two coats. Thank you for sticking with my long bout of fangirling! The Walking Dead airs tonight! You can find out about all the happenings about Dollish Polish on their facebook page (including their upcoming Limited Edition monthly polishes that are going to launch soon). You can buy Dollish Polish here. As always I want to know what you think and see those fingertips! Go take a mani selfie of your Walking Dead inspired manis and post them on my facebook page! This entry was posted on October 28, 2013, in Dollish Polish, Fandoms, The Walking Dead. I promised you nail art did I not? I’m fairly certain that I did! I was inspired by a manicure by CutePolish on YouTube. You can view her videos here. My handpainting skills are not all that I would love them to be (I’m still practicing!!!) so I knew that if I was going to recreate the cute mummy in her Halloween mani I was going to be using tape! 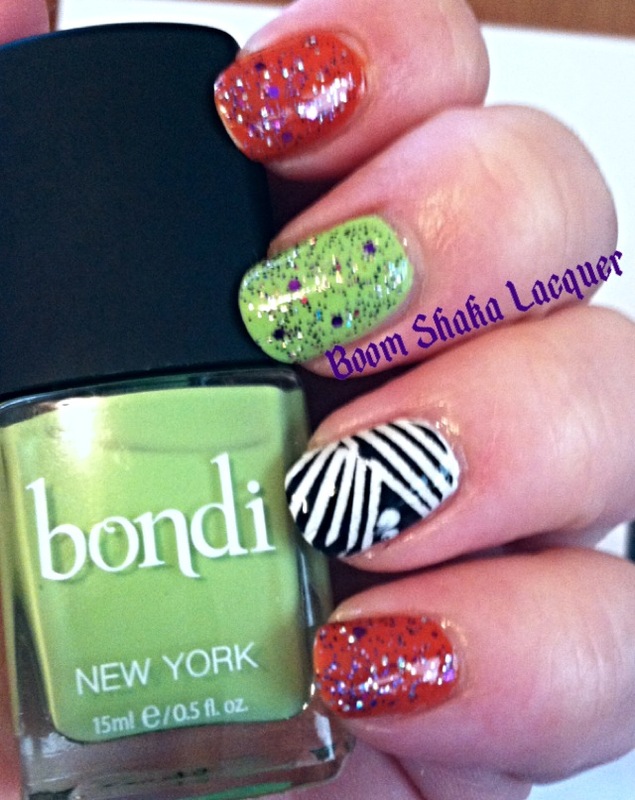 For this mani I used Bondi – The Limelight, Julep – Ingrid, and Barielle – Purple Hearts. All of these polishes were great to work with, I love both Bondi and Julep’s cream formulas! Purple Hearts by Barielle went on like a dream with great glitter spread in one coat and was also not very rough to the touch and did not require anything but a generous coat of HK Girl to smooth it all out! Not to mention purple and silver and black glitter topper played right into my Halloween theme! On the accent nail I did a coat of Illamasqua scorch and then using striping tape I taped off the design and painted over it with Mentality Rascal. When I pulled the tape off I added the eyes and then covered the whole thing with HK Girl Top Coat! I hope you enjoyed this Halloween nail art – I was pretty pleased with how it turned out! Share your spooky halloween manis with me! Come visit me on Facebook! This entry was posted on October 26, 2013, in Nail Art. Hihihihihi! I’m super excited today! I’m bringing you a lovely lovely polish from Jindie Nails – yes that’s two Jindie Nails posts in a row but I really adore Jindie Nails! Plus we’re nearing the end of October and Breast Cancer Awareness month and I wanted to showcase Jen’s gorgeous BCA limited edition polish – Hope. This beauty is a lovely baby pink crelly filled with multi-sized circle glitters in dark pink, white, silver, and gray – some of them are matte and some are metallic and some holographic. Also sprinkled throughout is a dark pink microglitter. Furthermore it glows in the dark (I’m afraid I was unable to capture this phenomenon, but trust me it’s very cool!) Unfortunately Hope is sold out but I still wanted to show it off! Just look at that. I just love how pretty and feminine this polish is! Now I will say that the crelly base is very sheer so if you are concerned with VNL (Visible Nail Line for my nail polish newbies) then you would definitely need three coats. This swatch is two coats with one dabbed coat. I did have to manipulate and place glitters for this polish but it wasn’t that difficult and really didn’t bother me in the least. Because the crelly base is sheer on this formula the glitters do tend to “float” above the polish and Nail Pattern Boldness Glitter Food was absolutely necessary to smooth out the roughness and protect the glitters from popping off the nail. I topped the whole thing off with my favorite HK Girl topcoat. You can keep up with all the news about Jindie Nails on facebook to find out about upcoming limited editions, new lines, and restocks. You can buy Jindie Nails in their shop, and also at Llarowe, and Harlowe & Co. Also since I posted this Jindie announced that they are have a restock on Friday October 25, 2013! You can check out the colors that will be available here, including a special edition, Clearly Blinded! There you have it – this is probably my last BCA mani for the month as I will be focusing on Hallowe’en next week!!! As always show me your Jindie or BCA manis on my facebook page! 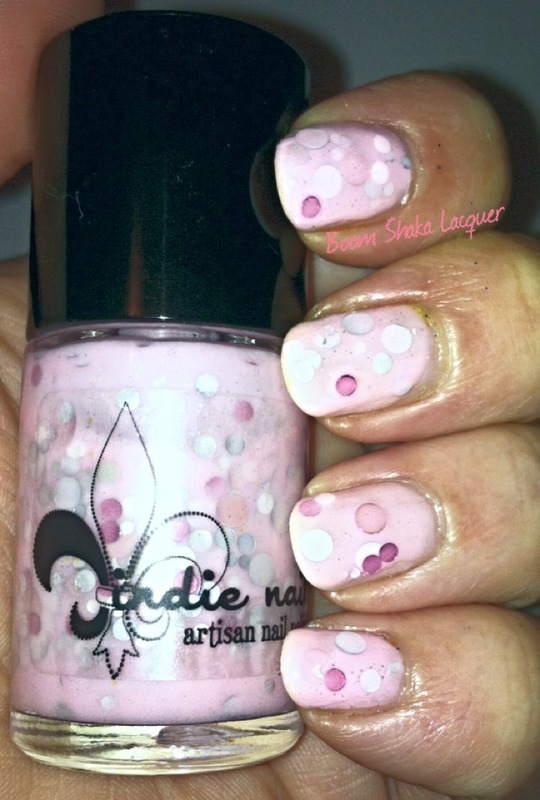 This entry was posted on October 24, 2013, in Jindie Nails. Jindie Nails is a great brand but it is understandably a little intimidating to folks who are new to the brand. 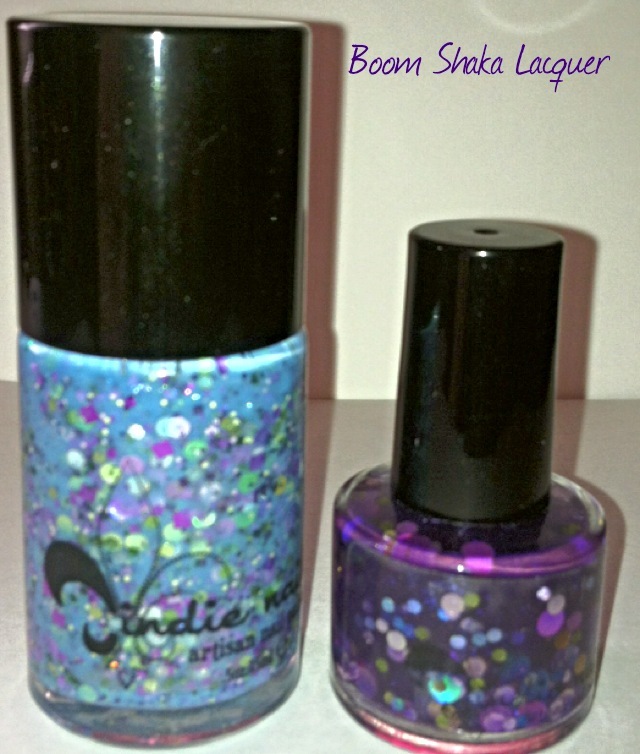 I think the type of lacquer that Jindie does better than just about anyone are her crellies. A crelly polish is a cross between a jelly (a translucent based polish that looks like a gel or jelly on the nail) and a cream polish. The effect is a cream polish that allows glitters to also be involved without being overpowered by an opaque cream polish. She also does some amazing glitter toppers and some jelly polishes as well, but I will admit the ones I love the best are the crellies. What I have for you today are Jindie’s Anniversary polishes, I called them a duo and she sells them as a duo but they are really two different celebrations of what she represents in the indie polish world! There is a stunning crelly based polish called Anniversary Seaquins and a lovely squishy jelly based polish called Purple Universary and they are tons of fun! So I’m going to start with Purple Universary. I will be utterly honest in saying that this polish I got in the mini size and is in her old mini bottle which are a royal pain in the toosh. I did have difficulty getting the lovely glitters out onto the nail. I do not experience this same issue with her regular sized bottles and she has recently changed her smaller sized bottles to a bottle that is less difficult to work with than the old minis. I loved the polish though which is a deep purple jelly absolutely packed with circle glitter (my favorite) in different colors and finishes (some shift, some are holographic, some are metallic). I like the sort of squishiness I got by not going fully opaque with the polish, but a third coat would have definitely been fully opaque. Next up is hands down my favorite – when she showed swatches of this on her facebook page I KNEW I had to get it!!! It’s her signature crelly base in a gorgeous medium blue shade and it is packed with glitter. There is multi-colored square and dot glitters along with hexes and it’s a total feast of glitter on your nails. This polish gave me no trouble whatsoever with application. Both polishes show two coats. There was more of the dab method being used with Purple Universary whereas Anniversary Seaquins went on smoother with a better glitter spread, I do think that this is mainly due to the mini bottle and I will probably at some point acquire a full sized bottle of Purple Universary to make my life easier because I do love the polish. I will say that I find that Nail Pattern Boldness Glitter Food is a MUST with these polishes. Because they are so full of chunky glitter they can be a bit “hungry” and when applied have a very chunky texture. I then top the whole thing off with a super shiny quick dry top coat (HK Girl FTW!). You can find Jindie Nails here and on facebook and she is also on instagram! You’ll definitely want to follow on Facebook so that you will know when restocks are happening as her polishes tend to go very fast. Jindie Nails is also available at Llarowe and Harlow and Co. So do you have any Jindies? What are your thoughts about these gorgeous polishes? Wanna show off your Jindie Manicures? Come see me on facebook I would love to share your pics!